What are Rudraksh Beads ? Its tree is large & evergreen. It is as big as banyan tree & takes 15-20 years to grow. In usual height, the tree grows to 25 feet with girth of 3 feet. The bark of rudraksh tree is dark, rough and marked with small scales. The leaves are oblong oval in shape. The size varies from 3” to 6”. Each leaf has a highly toothed leaf edges. 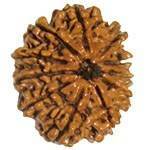 The flowers of rudraksh are creamy and most attractive in look. The blooming takes place during rainy season and and flowering during March-May. It comes in different colours and sizes. They are categorized on the basis of the line on them. They comes from One faced to Thirty Eight faced but commonly available form 1 - 21 mukhis. It is said that its seed contains the secrets of entire evolution of the cosmos within it. The devotees of Shiva, observe forms of Shiva, Shiva-Parvati, Shivalinga etc. in these beads. Each and every bead has unique energy or vibrations, which helps in correction of our aura(energy). According to Shiv Puran, wearing it brings Prosperity , happiness and Good Health to the Wearer. According to Vidyesvara Samhitha, they are available in Four colours, White, Red , yellow and Black. According to Padma Puraana, a man obtains a lakhfold merit by seeing them, a crorefold merit by touching it and ten crores of merit by wearing them . Ecologically, the species of rudraksh are widely distributed from Nepal to the Himalayan foothills to the South East Asia, China, Sri Lanka, Bali, Indonesia, Java, Jakarta, pacific Islands, Sumatra, New Guinea to north Australia, and even Hawaii. 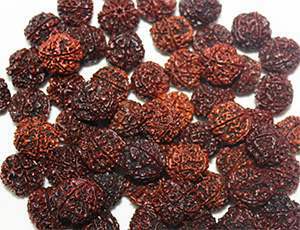 Nepal is believed to be the original birth place of all rudraksh species. It is the only country which produces maximum cultivation of rudraksh in its Bhojpur area Dhingla in the Arun Valley of Nepal, famous for large and excellent varieties of rudraksh. 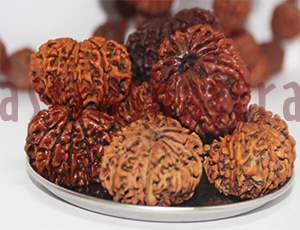 Nepal also specializes in producing the best quality of rudraksh of high export value. Java (Indonesia) is the only country which produces not only the largest size of rudraksh but also the streakless variety of rudraksh bead which has no vertically grooved lines on it. Such types of natural and specialized rudraksh beads are known for their largest size without vertical grooves on them which are exported from Java to various parts of the world. These varieties are also called ‘zero faced’ rudrakshs. Some of these large grooveless rudrakshs have no roughage due to absence of protuberances on the surface. Hence, their surface is flat & they are named as AMLASAR RUDRAKSH. 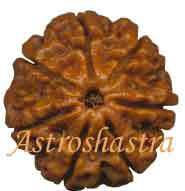 Studies have revealed that this type of rudraksh is very effective in the cure of cancer. Their trees are found in Nepal, Indonesia, India and countries of North Asia. They are there in some parts of the Western Ghats in South India, but the best quality ones come from Nepal, as certain altitude in Himalayas , the soil, atmosphere, and everything influences it. From where can you buy Original and Authentic Beads ? It is always better to buy from authentic store know to you. Its not just buying but also it should be charged to give you benefit. You should buy from source who energize them and channelize their energies to suit you. Genuine, energized and selected beads are available at Astroshastra, which are selected by experts in healing therepy. We have other energized astrological products like Gemstone, Yantras etc. Astroshastra is committed to provide world, with rare source of energy with purity and certificate of authenticity. You can wear BEADS , BRACELETS, PENDANTS OR MALAS . They can be worn in Silk or Cotton Thread , Brass, Silver or Gold. The Malas are made in 11 beads, 21 beads, 54 beads or 108 beads rosaries. Astroshastra has made different combination pendants, bracelets and rosaries and energise them for your benefit. Our beads are not only genuine but are sent after being energize by rituals mentioned in ancient vedic literature. There are various stories regarding the origin, in various Puranas. Ancient vedic scriptures like Shiva Purana, PadmaPurana (Chap 57) Srimad Bagwata (Chap III to VII ) Rudraksh Jabbalaoapanishad, Mantra Maharnava, etc. mentioned about the greatness and wonderful properties of beads. Once Lord Rudra was performing a great penance for thousands of divine years. He slightly opened his eyes. Drops of tears fell from his half closed eyes. From those tear drops, cropped up its plants. intermediate region between the Heaven and the Earth due to the boon of Brahmaa. Lord Rudra was appraised of the trouble being created by the demon to the gods. Rudra strung his bow with an arrow and killed the demon. Drops of perspiration fell down from the body of Rudra, who was tired with exertion. 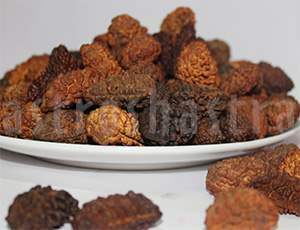 Several Rudraaksha pants cropped up from the drops of Rudra’s perspiration on the Earth. It can nullify the effects of malefic planets to a great extent. Shastras say beads of any mukhis can never do any harm to the wearer unlike Navratnas, which have to be carefully chosen. No other necklace or bead is so auspicious and powerful as them. You can click on the name of the beads mentioned on right side of page to know more about them. We have different combination Pendants , Bracelets and Malas listed under each heading on the right side of the page. HAPPY BROWSING. 1. They are lucky charms for health wealth and prosperity. 2. They are very good in controlling Blood Pressure. 3. They open Body Chakras and help in meditation. 4. They are helpfull in removing negative energies from body as well as home/office. 5. They appease their corrosponding planets. 6. They negate the malefic doshas in horoscope. Like Manglik Dosha , Kemdrum Yoga, Kaal Sarp Dosha. 7. They remove all malefic Tantra effects on the wearer. 8. If the ash obtained by burning bead is mixed with the ash of gold in equal proportion and taken , one ratti as a doe in the morning and evening , high blood pressure is controlled. 9. In case of small pox, take its ash with black pepper in equal proportion with water, kept at night for three months. One will cured positivey. 10. If a big bead is rubbed and paste is applied on a poisonous wound it will heal immediately without affecting the patient adversely. 1. It always has a rough surface but is not thorny, Thorny surface are artifically made. 2. In Natural beads the lines are not equidistance, but in an artifical ones, these are found carved at equidistance. 3. The energies can be checked by moving copper bangle around the Beads. 4. Its best to buy beads from a Genuine and Authentic Dealer. On monday morning, one should take a bath before sunrise and the beads should be kept in oil for four to seven days, thereafter be washed well raw milk, After that the rosary should be washed in holy ganga water. The rosary should then be put in the smoke of dhoop, then after reciting the namtra "OM NAMHA SHIVAYE" eleven times, the rosary or bead be worn. If you have any doubts or would like to get any information or clarification in this regard, mail us at consult@astroshastra.com . According to Shiv Puran , there are no specific rules for wearing them except for getting it energised and chanting the matras specific to that particular bead. Anyone can wear them, Male/Female, person belonging to any religion or caste. There are no formalities or restrictions, to be observed after wearing them. There are only two restrictions where the wearer shall remove the mala or bead i.e. while going to funeral or where birth has taken place. 1. Wear only energized beads i.e. wear the beads only after Pran Prathistha by Mantras and rituals . 2. You can remove them and wear them again, but after this, each time you remove/ wear it chant the mantra 11 times. 3. You can wear any combination or beads but its best if you wear them as per your birthchart. You can consult Astroshastra expert for advice, mail us your birth details at consult@astroshastra.com . 4. Do not share your mala with anyone. 5. Do no wear the Japa Mala and do not perform Japa with mala used for wearing. 7. You can use Planetary Oils , Coconut oil, Mustrad oil or Desi Ghee for oiling. 8. Women should not wear them during menstrual periods. 2. Oval or flat like almond. It is half moon shaped that’s why it is called Ardh-chandrika (Kqju Dana or Badam shape). 3. Long - semi round shaped (Rondraksha). In size, they are known to be found as small as black pepper and as large as Amla [Emblica officinalis) or table tennis ball. It varies from 0.25 to 2 cm. According to Meru Tantra, the bigger size of rudraksh and Shiv Linga are effective for prayer. 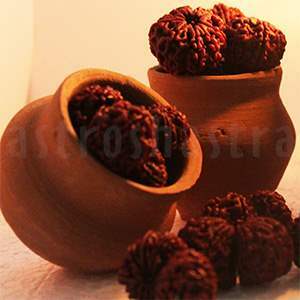 The hard, big and highly ornamented rudraksh are considered virtuous in effectivity. The smaller beads are highly valued as rosary as they are easy to carry and wear.